A photocopy of your WD AGO 53-55, DD-214 or ERB/ORB displaying your completion of the Special Forces Qualification course. Click for larger image The United States Army Special Forces Tab is authorized to individuals who are designated by completion of training, military occupation or authorized assignment as Special Forces qualified. The Special Forces Branch Insignia formally established in 1967 (created in 1961) is retroactive to 1890. I. DESCRIPTION: Branch Insignia: Two crossed arrows 3/4 inch in height and 1 3/8 inches in width all gold color. Branch Plaque: The plaque design has the branch insignia, letters, and rim in gold. The background is Jungle Green. Regimental Insignia: Personnel assigned to the Special Forces Branch are all affiliated to the 1st Special Forces since there is only one Special Forces regiment. The insignia is a silver color metal and enamel device consisting of a pair of silver arrows in saltire, points up and surmounted at their junction by a silver dagger with black handle point up; all over and between a black motto scroll arcing to base and inscribed "DE OPPRESSO LIBER" (Liberate From Oppression) in silver letters. Regimental Coat of Arms: The regimental flags for the lst Special Forces has the shield of the coat of arms appearing on the breast of a displayed eagle. The background of the Special Forces regimental flag is Jungle Green. The Special Forces Groups have the same design and use this coat of arms on the Special Forces Group flags; however, the designation scroll contains the designation of the group instead of the designation "First Special Forces". Regimental Insignia Symbolism: The shield of the Coat of Arms was approved for the First Special Service Force of World War II on 26 February 1943. The knife is of a distinctive shape and pattern and was issued only to the First Special Service Force. The crest is the crossed arrows from the collar insignia worn by the First Special Service Force in World War II but changed from gold to silver for harmony with the shield and to make a difference from the collar insignia. The coat of arms and distinctive unit insignia was approved on 8 July 1960. Branch Colors: Jungle Green. 80066 cloth; 67191 yearn; PMS 343. The establishment of jungle green as the branch color was approved by the DCSPER on 22 May 1987. Silver Gray is used as a secondary color on flags and guidons. Birthday: 9 April 1987. The first Special Forces unit in the Army was formed on 11 June 1952, when the 10th Special Forces Group was activated at Fort Bragg, North Carolina. A major expansion of Special Forces occurred during the 1960s, with a total of eighteen groups organized in the Regular Army, Army Reserve, and Army National Guard. As a result of renewed emphasis on special operations in the 1980s, the Special Forces Branch was established as a basic branch of the Army effective 9 April 1987, by General Orders No 35 dated 19 June 1987. 1. Description: On a teal blue arc tab 3 1/4 inches (8.26 cm) in length and 11/16 inch (1.75 cm) in height overall, the designation SPECIAL FORCES in yellow letters 5/16 inch (.79 cm) in height. The subdued tab is olive drab with black letters. 2. Metal Tab: The Special Forces Tab metal replica is available in two sizes, full and dress miniature. The full size version measures 5/8 inch (1.59 cm) in height and 1 9/16 inches (3.97 cm) in width. The miniature version measures 1/4 inch (.64 cm) in height and 1 inch (2.54 cm) in width. 3. Wear Policy: The full color tab is worn 1/2 inch below the shoulder seam on the left sleeve of the Army green coat. The subdued tab is worn 1/2 inch below the shoulder seam on the left sleeve of utility uniforms, field jackets and the desert battle dress uniform (DBDU). The full size metal tab is worn only on the blue and white dress uniforms and the AG shade uniforms. The dress miniature tab is worn on the blue and white mess and evening mess uniforms. When miniature medals are worn on the blue and white dress uniforms, personnel may wear the dress miniature Special Forces tab metal replica. 4. Award Eligibility: Awarded to any person in the Active Army or an active Reserve status who meets the following criteria: (1) Successful completion of the Special Forces Qualification Course or the Special Forces Officer Course. 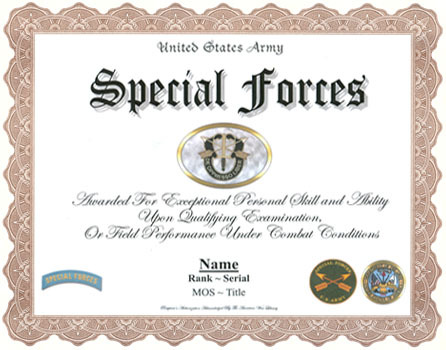 (2) Active Army Personnel upon successful completion of the Resident Special Forces Qualification Course, the Special Forces Officer Course, or the then approved program of instruction for special forces qualification in SF training groups, and who were subsequently awarded, by competent authority, SQI "S" or 3 (Officer Personnel), MOS in Career Management Field 18, or Functional Area 18. (3) Reserve Component soldiers in an active Reserve status upon successful completion of the Resident Special Forces Qualification Course, the Reserve Component Special Forces Qualification Course or an approved program of instruction per the U.S. Training and Doctrine Command (TRADOC). In addition, Reserve component personnel must have been awarded, by competent authority, SQI "S" or 3 in MOS 11B, 11C, 12B, 05B, or 91B, ASI 5G or 3, a MOS in Career Management Field 18 or Functional Area 18 before becoming eligible for award of the tab. (4) Subsequent to 1955, Reserve Component personnel must have successfully served for 120 consecutive days, or more, as a company grade officer or enlisted member of a Special Forces Operational Detachment (A-Team), Mobile Strike Force, Special Forces Reconnaissance Team or SF Special Project Unit and must have been awarded the Combat Infantryman Badge or Combat Medical Badge for such service. (5) Prior to 1955, Reserve Component personnel must have served for 120 consecutive days or more, as an officer or enlisted member of the 1st Special Service Force between August 1942 and December 1944, OSS Detachment 101 between April 1942 and September 1945, OSS Jedburg Detachments between May 1944 and December 1945, OSS Operational Groups between May 1944 and December 1945, the Sixth Army Special Reconnaissance Unit (also known as the Alamo Scouts) between February 1944 and December 1945, or 8240th Army Unit between June 1950 and July 1953. (6) Former wartime service. The tab may be awarded retroactively to those personnel who served with Special Forces units during wartime and were either unable to, or not required to, attend a formal program of instruction, but were awarded a SQI "S" or 3 or "5G" by competent authority. The Commander, U.S. Army John F. Kennedy Special Warfare Center (USAJFKSWC), Fort Bragg, North Carolina, is the award approving official. 5. 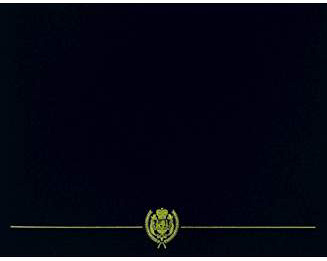 Date Approved: The Chief of Staff, Army, approved the cloth tab in June 1983 and the metal replica on 25 November 1984.